Looking for our Faux Wood Blinds? All of our wood blinds are made of 100% kiln-dried selected hardwoods. There are 18 colors in smooth stain or painted finishes for 1"and 2" and 6 colors in sandblasted finish for the 2" premium North American hardwood blinds. There are 9 colors in smooth stain or painted finishes for the 2-1/2" premium North American shutterblinds (routeless). Ends of slats are finished to maximize beauty and durability. Wood valances, bottomrails, cord tassels and bottomrail plugs are stained or painted to match the slats. Side returns on valances are miter-cut and glued. Cotton cloth tapes are available in 17 standard twill colors and in 17 premium decorative colors for 2" blinds. Steel headrails are color coordinated to the wood slats. (hold-down brackets, spacer blocks and extension brackets when specified). Please note: Our wood blinds are a true wood product made from 100% kiln-dried hardwood; consequently, there will be variations in color, grain and texture � all characteristics of wood. The variations are more noticeable in blinds of light color. These variations are normal and natural and are considered acceptable quality. Blinds under 12� wide must have a center tilter. Blinds under 12� wide add $20 per blind. Blinds over 72" wide and longer than 60" must be made as a two or three blinds on one headrail. 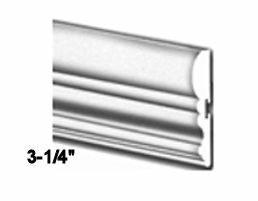 If you would like to order your blinds as 2 on 1 headrail (Add 15%) or 3 on 1 headrail (Add 20%), please click here. Outside Mount Valance - 3" face 1-1/2" greater than headrail, mitre-cut and glued return 2.875"
Slats,valance,bottom rail,cord tassels and plugs are color coordinated to match with finished ends. 3 business days! View ALL 24 Colors Available!! View ALL 24 Colors Available! !